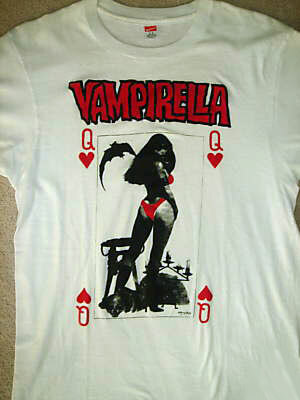 There have been a number of Vampirella t-shirts available to the general public, not all of which are listed here (yet). Not all are "official" Harris/ Warren licensed items. 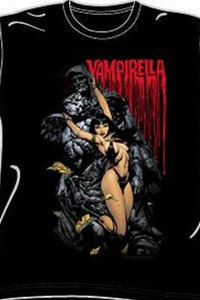 The official t-shirts tend to be reproductions of iconic Vampirella covers, whereas the unofficial t-shirts have a range of artwork - from mediocre to excellent. 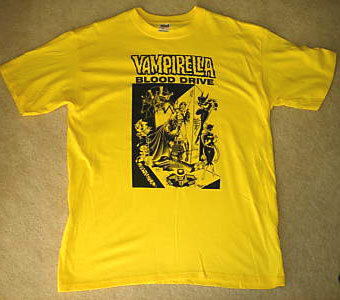 Blood Drive t-shirt and sweat shirt - available in Grey and Yellow. 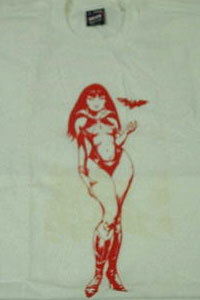 This looks like a "home made" sketch printed onto an A4 transfer. 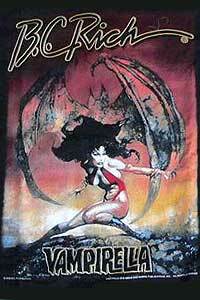 John Bolton art as used on the BC Rich Vampirella guitar. 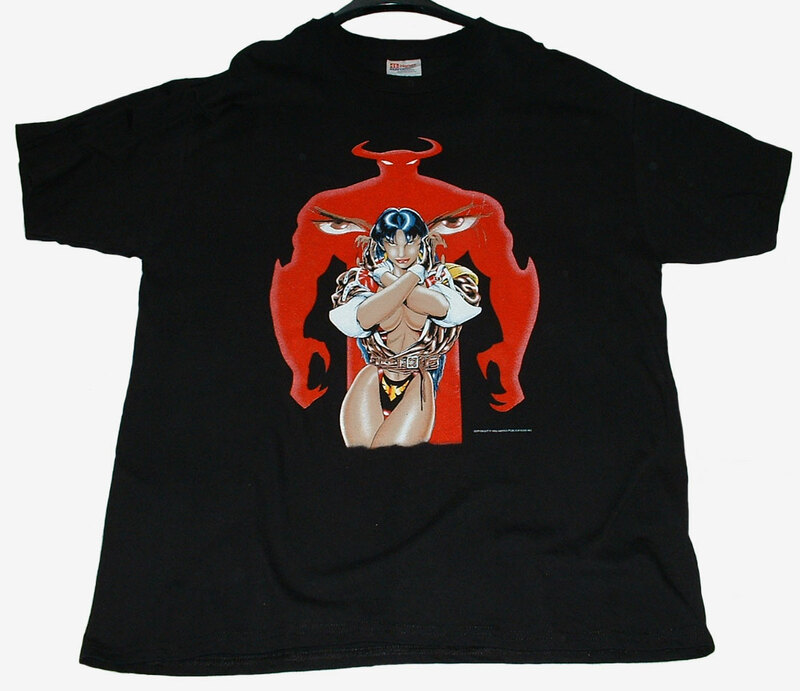 This t-shirt was used to promote the Pittsburgh 1996 Comicon. FINE - One shoulder "tank-shirt". 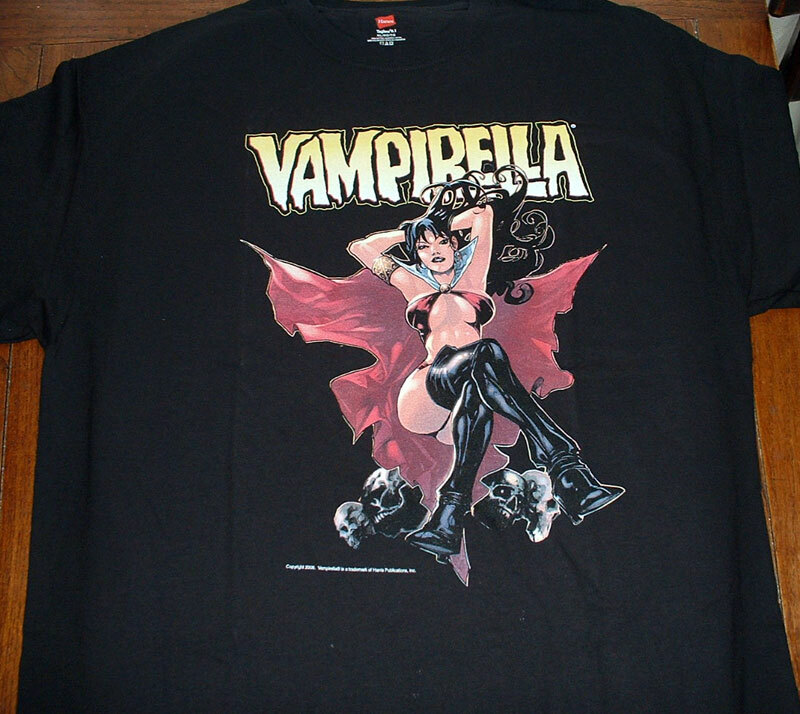 The top has Vampirella's face on the front and a black fringe hanging from the the one shoulder /sleeve (to look like her hair). 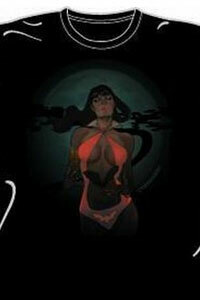 eBay seller gift_captain has this "bloodbath" cover by Ebas up for sale. 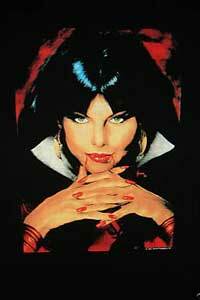 Also from gift_captain comes this Joe Jusko offering from the Blood Lust series. 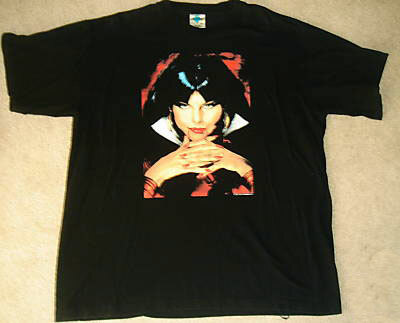 eBay seller zkcstylez is offering this Maria Di Angelis t-shirt for sale, though I have to say it doesn't look that inspiring. 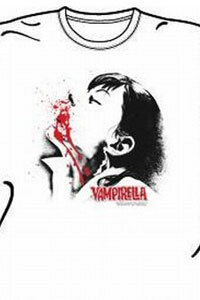 Another Jusko classic image from the BloodLust series. A rather fetching lacy top from FINE. The artwork of Bo Hampton seems to be used here. 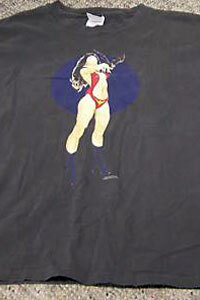 Seen on eBay, the seller claimed that this long-sleeved t-shirt was from the early 1970s - i.e. a Warren production. 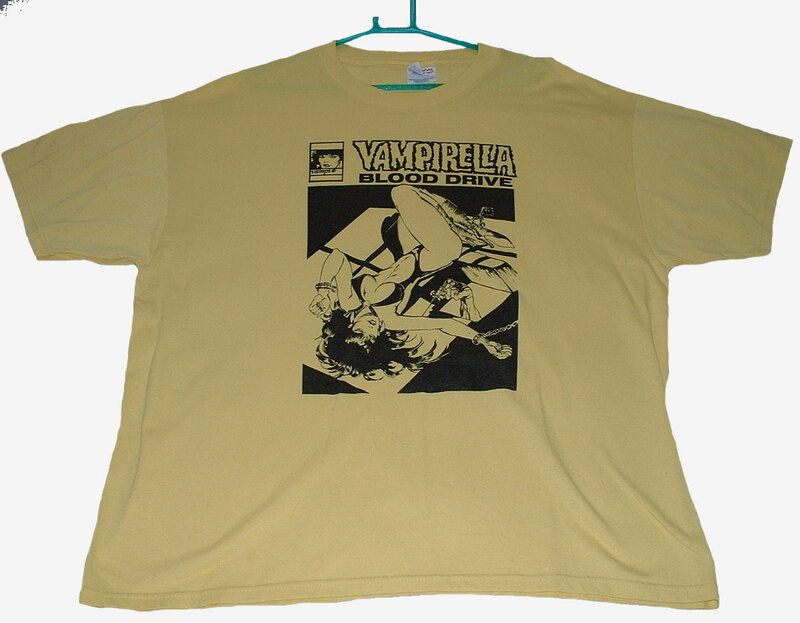 The same eBay seller with another "Warren" long-sleeved t-shirt from the 1970s. 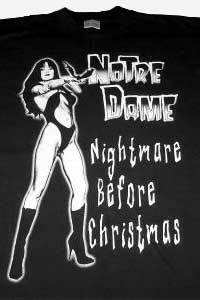 Distributed Exclusively at FORRYCON in New Zealand (1991). 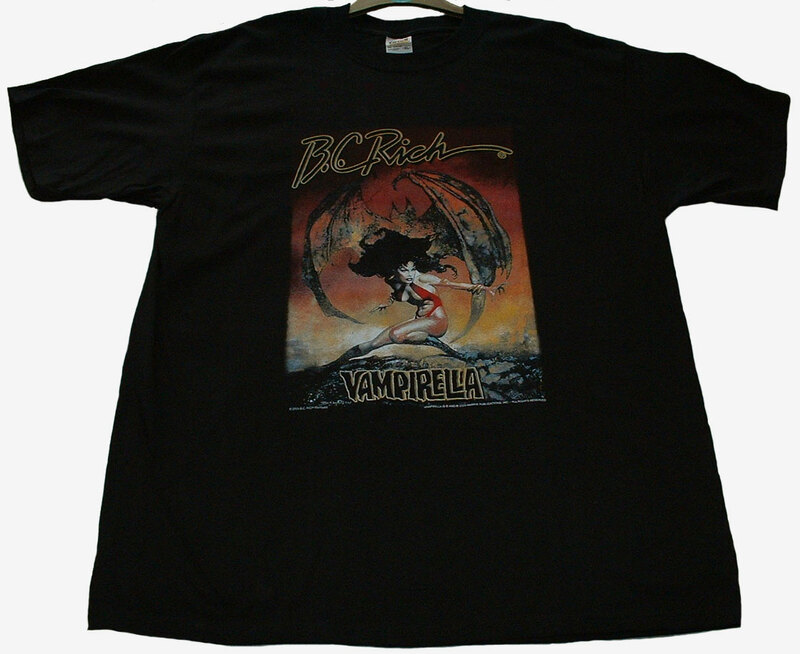 Featuring cover art from Sad Wings of Destiny by Joe Jusko, this t-shirt was made in 1996 and available only to members of the Vampirella Fan Club, The Scarlet Legion. 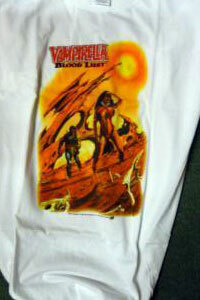 Produced for a Vampirella Blood Drive in 2004. 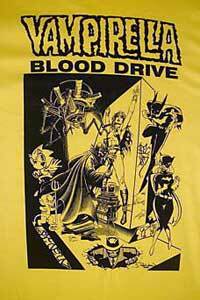 Only 60 of these shirts were made and only given to attendees who donated blood! 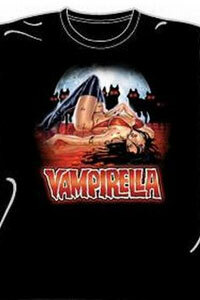 Art by Gonzalo Mayo. 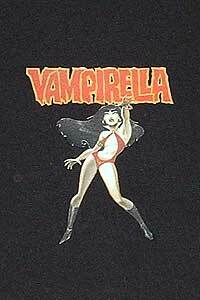 A all time fan favourite image of Vampirella by Sanjulian. 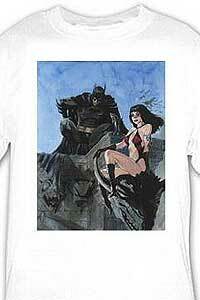 Art by Louis Small, Jr., this shirt was produced for and sold exclusively at the Philadelphia Comic Con in 1994. Kevin Nowlan(?) 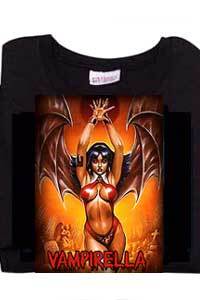 art from a t-Shirt company in Malaysia. 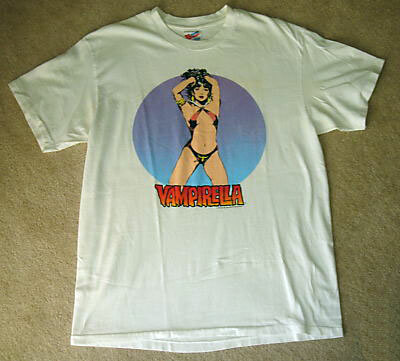 I saw this on eBay and had to have one. 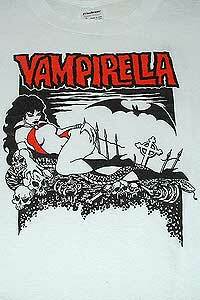 From the Vampirella Quarterly series, this is Stephen Segovia's Vampirella at rest (2008). 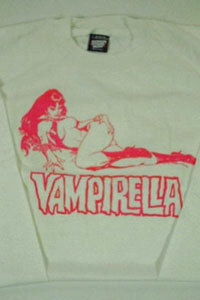 The Fine clothing company keep producing really nice Vampirella stuff! 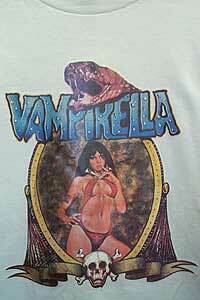 I bought this from a lady in Spain, who graciously modeled it for me. How could I say No? 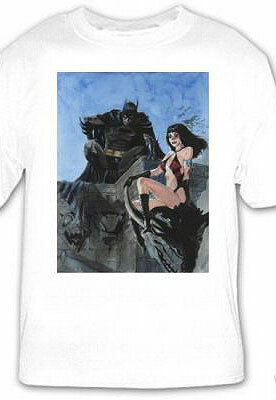 Joe Jusko is certainly a favourite as far as t-shirts are concerned. 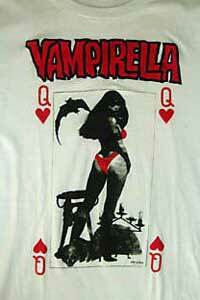 ...as is Pepe Gonzalez. 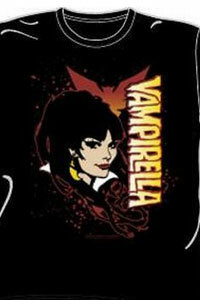 2010 was a quiet year for Vampirella publishing, but certainly a busy one for peripherals. 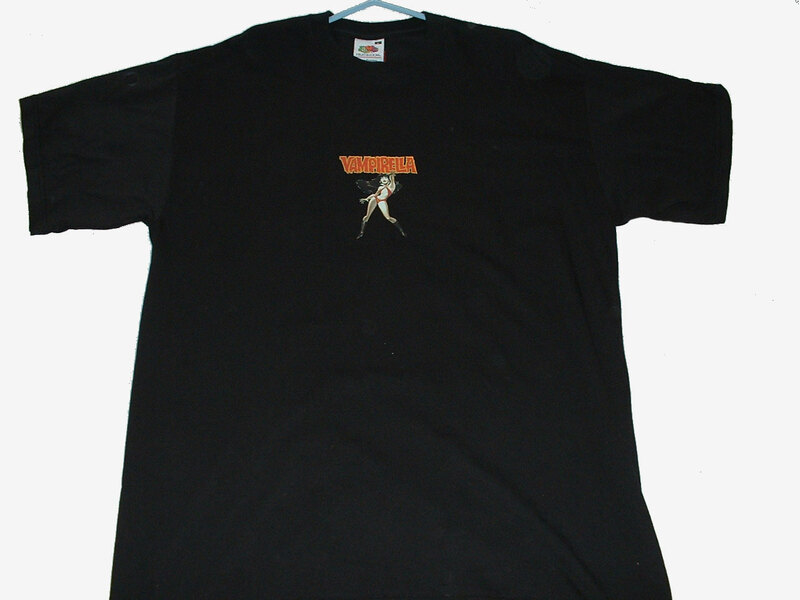 Reputedly licensed from Harris the following eleven t-shirt designs were freely available on eBay. 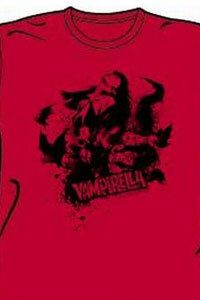 I know this design... I think it was a piece of digital art done in Poser.